I had dinner tonight with friends from work who are with me in Boston Ma for our conference. Tonight we went to "The Oyster House", the oldest restaurant in the U.S. The food was fantastic and it was nice to finally have a nice relaxing dinner with friends. I called my wife and told her that I was having lobster tonight. She asked me if they were alive and I told her that they were and in a tank. She told me that I couldn't eat him if he is alive so I made the proper introduction to the lobster, asked him his name and requested to eat him. 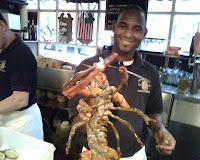 The lobster gave me permission and I forwarded his photo to my wife for approval. 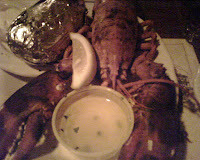 At the end, Larry the Lobster met his fate on my plate but his last act was captured on photo. wow.. i luv the pix..